Micro needling is an FDA approved non-surgical treatment for the treatment of fine lines, facial sagging, acne scarring, and facial scars. Micro needling works by using a device to create micro-injuries to the skin and dermis, the layer of tissue below the skin. The micro-injuries are created by fine needles that make tiny holes in the skin. How Does Micro Needling Improve the Skin? The body has a miraculous ability to heal. During a micro needling procedure we are using the body’s healing ability to improve the quality and texture of the skin. 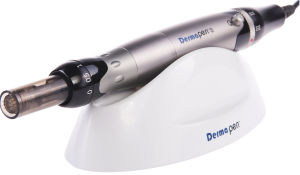 The micro needling process injures cells of the skin to stimulate the healing process. The injured skin responds by releasing multiple growth factors that stimulate the formation of new collagen and elastic tissue. It may seem counter-intuitive to create healthier skin we cause damage to the skin, but this is the way the process works. What is the Device Used at Carolina Facial Plastics? There are many different micro needling devices in Charlotte. At Carolina Facial Plastics, we believe we chose the best device on the market. The micro needling device we use is called the Rejuvapen. In my opinion, the Rejuvapen is the standard that all other micro needling devices compare themselves. Rejuvapen is one of the oldest and scientifically tested micro needling devices. At Carolina Facial Plastics, we do our best to have the best devices available for our patients. What are the Indications for Rejuvapen? Micro needling is a safe and effective treatment for the above skin conditions. Any adult patient can undergo a micro needling treatment. It is great for patients of both light and dark complexions. ncbi.nlm.nih.gov gives you more information on the advances in micro needling. Who Cannot Undergo a Rejuvapen Treatment? How Many Rejuvapen Sessions Does a Typical Patient Require? Micro needling results are driven by the activity of the body healing itself in response to micro-injuries. In order to have an effective result, the procedure will need to be repeated. Depending on the condition and the severity of the problem, patients may require between 3 and 6 sessions. Is a Rejuvapen Procedure Painful? We go through great lengths to ensure the procedure is completed with little to no pain. We apply medical grade numbing cream to the treatment area before the procedure. Using this technique, patients feel little discomfort during the treatment. Each treatment session will take about 1 hour. It takes 30 minutes for the numbing cream to take full effect. The process takes about 15 minutes and there is 15 minutes of after care. What is the Recovery After a Rejuvapen Treatment? Day 1: Red appearance of the skin. It will look like a sunburn. Day 2: A red or pink hue persists like a moderate sunburn. Minor swelling may be present on the second day. If I Have Had Botox or Dysport, Can I Undergo Rejuvapenn Treatments? Do not have a Rejuvapen procedure within 48 hours of injections of Botox or Dysport in the proximity to the treatment area to avoid potential misdistribution of injected toxin. If I Have Had Facial Dermal Fillers, Can I Undergo Rejuvapen Treatments? Do not undergo a Rejuvapen procedure within 2 weeks of injections of dermal fillers to avoid potential unwanted inflammatory response. What Should I Do to Prepare for a Micro Needling Treatment? Discontinue use of Vitamin A derivatives (Retin-A), Auto-immune therapies and photosensitizing drugs and topical 72 hours prior to treatment. No Accutane treatments 6 months prior to treatment. No prolonged sun exposure or sun burns to the treatment area 24 hours point to treatment. Skin should be clean and make-up free. What Should I Do After a Micro Needling Treatment? Apply a Rejuvapen approved SPF physical defense moisturizer if needed. Take precautions against sun exposure. No direct sun exposure for 3 to 5 days post treatment. Do not apply chemical sunscreens for up to 24 hours after post treatment. Do not apply traditional cosmetics for at least 24 hours. Rejuvapen approved cosmetics may be applied. No shaving within 72 hours. Toners with alcohol base are to be avoided for at least 14 days post treatment. Patients may return to regular skin care regimen after 48 hours. How Do You Schedule Your Rejuvapen Procedure in Charlotte? If you are interested in learning more about micro needling or Rejuvapen, please call our office at (704) 842-3644 or fill out the online contact form on this website.